Extraordinary Autumn Scenery. Green Fields With Haystacks. Trees Covered With Orange And Crimson Leaves. Mountain Landscapes. 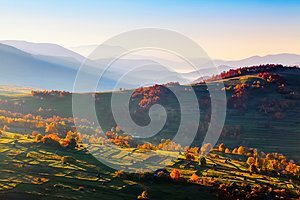 Photo title: Extraordinary autumn scenery. Green fields with haystacks. Trees covered with orange and crimson leaves. Mountain landscapes. Extraordinary autumn scenery. Green fields with haystacks. Trees covered with orange and crimson leaves. Mountain landscapes. Nice rays of the sun. Location place Carpathian national park, Ukrain, Europe.